Preface. Acknowledgements. Pattern Recognition. Patterns in the role of knowledge representation (T. Vámos). Application of evidence theory to k-NN pattern classification (T. Denœux). Decision trees and domain knowledge in pattern recognition (D.T. Morris, D. Kalles). Object recognition using hidden Markov models (J. Hornegger, H. Niemann, D. Paulus, G. Schlottke). Inference of syntax for point sets (M.D. Alder). Recognising cubes in images (R.A. McLaughlin, M.D. Alder). Syntactic pattern classification of moving objects in a domestic environment (G. Lim, M.D. Alder, C.J.S. deSilva). Initializing the EM algorithm for use in Gaussian mixture modelling (P. McKenzie, M.D. Alder). Predicting REM in sleep EEG using a structural approach (A.L.N. Fred, A.C. Rosa, J.M.N. Leitão). Discussions. Signal and Image Processing. On the problem of restoring original structure of signals (images) corrupted by noise (V.L. Brailovsky, Y. Kempner). Reflectance ratios: an extension of Land's Retinex Theory (S.K. Nayar, R.M. Bolle). A segmentation algorithm based on AI techniques (C. Di Ruberto, N. Di Ruocco, S. Vitulano). Graph matching by discrete relaxation (R. Wilson, E.R. Hancock). Inexact matching using neural networks (J. Feng, M. Laumy, M. Dhome). Matching of curvilinear structures: application to the identification of cortical sulci on 3D magnetic resonance brain image (S. Legoupil, H. Fawal, M. Desvignes, M. Revenu, D. Bloyet, P. Allain, J.M. Travere). Knowledge based image analysis of agricultural fields in remotely sensed images (N.J. Mulder, F. Luo). A texture classification experiment for sar radar images (A. Murni, N. Darwis, M. Mastur, D. Hardianto). Discussions. Probabilistic Reasoning. Spatio/temporal causal models (J.F. Lemmer). Potentials of Bayesian decision networks for planning under uncertainty (E.C. van de Stadt). Qualitative recognition using Bayesian reasoning (J. Liang, H.I. Christensen, F.V. Jensen). Learning characteristic rules in a target language (R. Bhatnagar). Discussions. Neural Networks. Why do multilayer perceptrons have favorable small sample properties? (Š. Ra&umacr;dys). Using Boltzmann machines for probability estimation: a general framework for neural network learning (H.J. Kappen). Symbolic approximation of feedforward neural networks (I.K. Sethi, J.H. Yoo). Analytical approaches to the neural net architcture design (W.J. Christmas, J. Kittler, M. Petrou). An alternative feedforward approach to neural classification problems (R. Tebbs, T. Windeatt). Contribution analysis of multi-layer perceptrons. Estimation of the input sources' importance for the classification (M. Egmont-Petersen, J.L. Talmon, E. Pelikan, F. Vogelsang). Neural networks - advantages and applications (E. Oja). Relative effectiveness of neural networks for image noise suppression (D. Greenhill, E.R. Davies). Discussions. Comparative Studies. An experimental comparison of neural classifiers with traditional classifiers (W.F. Schmidt, D.F. Levelt, R.P.W. Duin). Comparative study of techniques for large-scale feature selection (F.J. Ferri, P. Pudil, M. Hatef, J. Kittler). Neural nets and classification trees: a comparison in the domain of ECG analysis (J.L. Talmon, W.R.M. Dassen, V. Karthaus). An empirical study of the performance of heuristic methods for clustering (S.K. Mishra, V.V. Raghavan). A comparative study of different classifiers for handprinted character recognition (K.M. Mohiuddin, J. Mao). A comparison of the randomised Hough transform and a genetic algorithm for ellipse extraction (S. Procter, J. Illingworth). Discussions. Hybrid Systems. Relative feature importance: a classifier-independent approach to feature selection (H.J. Holz, M.H. Loew). An intelligent planner for multisensory robot vision (X.Y. Jiang, H. Bunke). Hybrid knowledge bases for real-time robotic reasoning (J. Horst, E. Kent, H. Rifky, V.S. Subrahmanian). Hybrid systems for contraint-based spatial reasoning (J.A. Parikh). Detecting novel fault conditions with hidden Markov models and neural networks (P. Smyth). A handwriting recognition system based on multiple AI techniques (P.E. Bramall, C.A. Higgins). A hybrid system to detect hand orientation in stereo images (A. Drees, F. Kummert, E. Littmann, S. Posch, H. Ritter, G. Sagerer). Discussions. List of Authors. List of Keywords. The era of detailed comparisons of the merits of techniques of pattern recognition and artificial intelligence and of the integration of such techniques into flexible and powerful systems has begun. So confirm the editors of this fourth volume of Pattern Recognition in Practice, in their preface to the book. 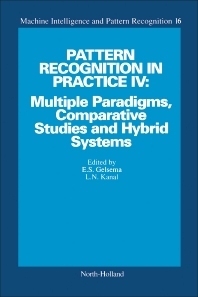 The 42 quality papers are sourced from a broad range of international specialists involved in developing pattern recognition methodologies and those using pattern recognition techniques in their professional work. The publication is divided into six sections: Pattern Recognition, Signal and Image Processing, Probabilistic Reasoning, Neural Networks, Comparative Studies, and Hybrid Systems, giving prospective users a feeling for the applicability of the various methods in their particular field of specialization.